A diverse crowd of Bermudians and residents packed out the dock at BIOS on Saturday for the Groundswell Lionfish Tournament 2014. The overall catch was up by 7 in total on last year with 72 lionfish caught, though this could be due to an increase in participants. There were 8 hunting teams this year with a total of 94 participants. Spencer Wood caught the biggest fish at 16 3/4" compared to 18" last year. The Regiment entered a team for the first time and were rewarded Most Enthusiastic Team. 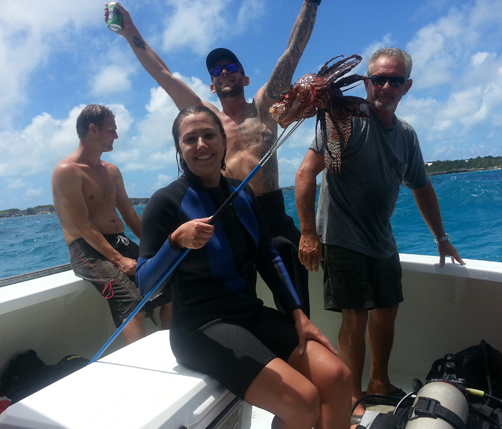 Gretchen Goodbody Grindley picked up the award for a new category - Huntress - after stripping the reefs of three lionfish. 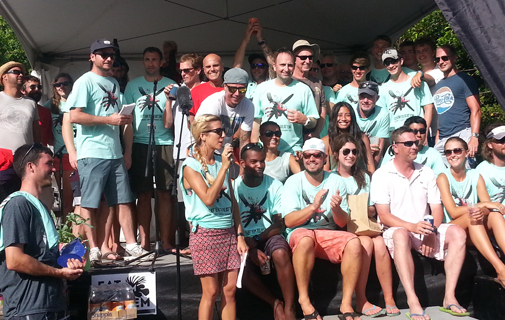 The Ocean Support Foundation hauled in a total of 44 lionfish. The team led by Triangle Diving is in a class of its own with a group of technical divers who can reach depths of 200 feet where larger numbers of lionfish are documented to be living. Lionfish do not belong in Atlantic waters and have no natural predators here. They are opportunist hunters with a voracious appetite and have damaged fish stocks in the Bahamas and the east coast of America. They have now taken hold in Bermuda and it's up to us to find a solution. Matthew Strong of Groundswell, the charity that was formed to raise awareness of the lionfish invasion in Bermuda and which organizes the tournament, said he was pleased with the diversity of the crowd this year and the increase in turnout. He told the Bermuda Sun: "It was a huge success. We broke records in most categories - there were more participants, more people turned out and it was a more diverse crowd than we've ever seen. It's encouraging to know the message is getting out to more and more people. Unfortunately more lionfish were caught, but we are happy that we took them off the reef." Selange Gitschner of Groundswell said she was approached throughout the day by people asking how they could buy lionfish to eat after tasting lionfish samples, prepared by Island Restaurant Group, at the event. There is a project underway, involving several bodies including government, to tackle them in the deep water using specially designed traps with the hope that they could serve a commercial market. Strong added: "It's our job to inform the public about these developments - hopefully, as the project develops - the supply can start meeting the demand and we can start making a real dent in the numbers." 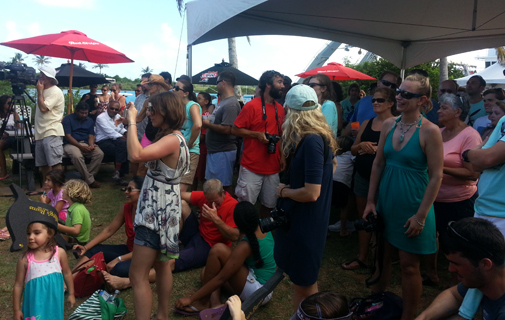 Next year the tournament will reach out to more chefs on the island and try to get them more involved. Want to help combat the lionfish?